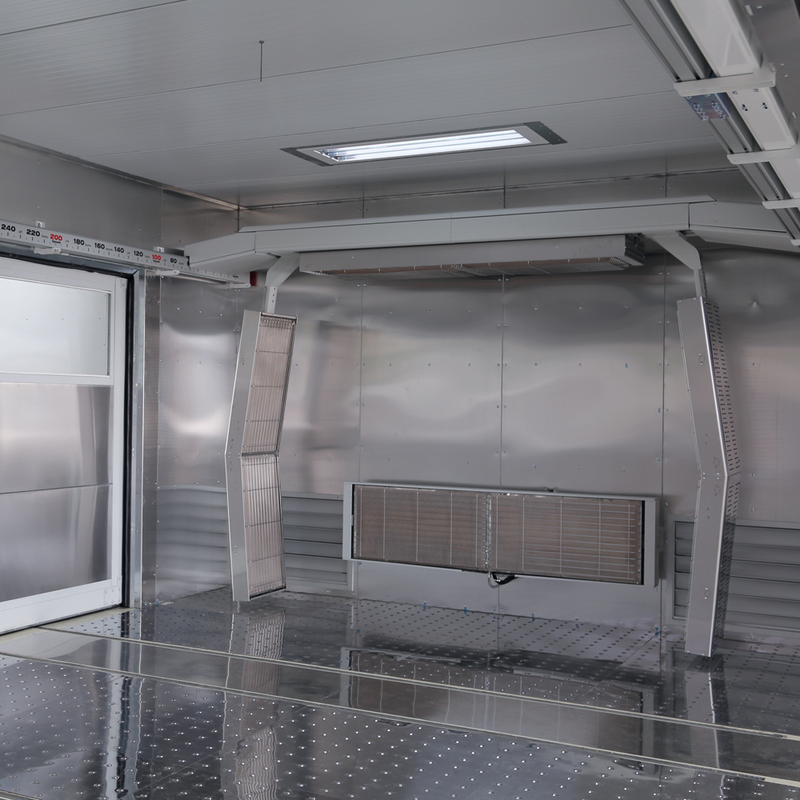 The KombiTron is a drying cabin that works in conjunction with a SprayTron booth. This product is exclusive to Symach. When combined with one SprayTron and equipped with robots, the daily production with two painters is 16-20 paint cycles per day. The KombiTron dries paint using an Easydry robot, not a burner. The KombiTron is a cabin that dries vehicles or pieces on stands in 8-12 minutes on average. This is because unlike a conventional oven that uses hot air, the KombiTron uses 100% radiant waves. 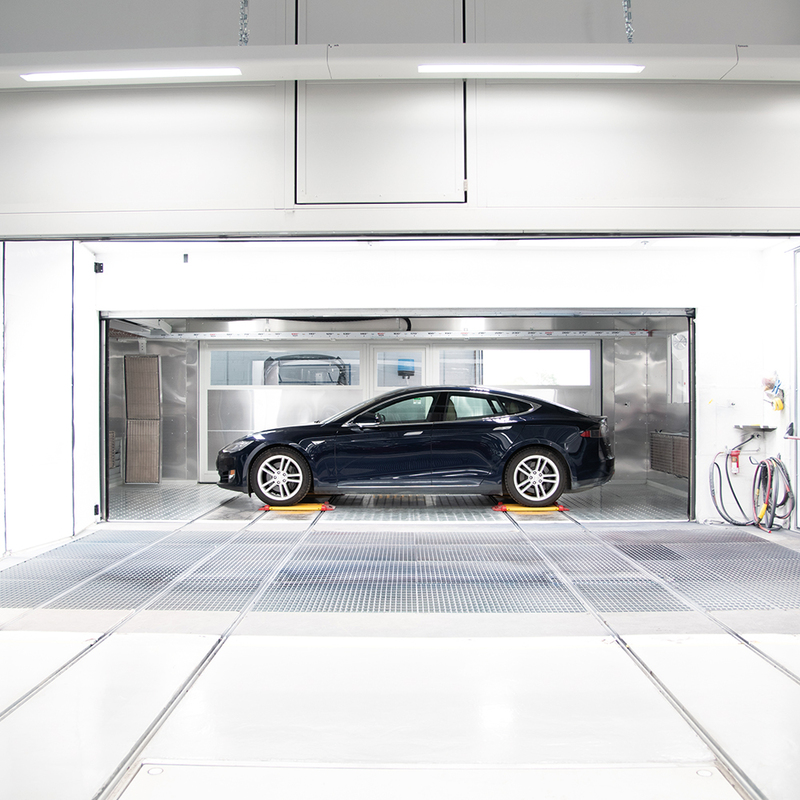 The inside walls and floor of the KombiTron are made of a reflective metal that collects and reflects the radiant waves released from the Easydry robot against the vehicle or painted parts without wasting any energy. 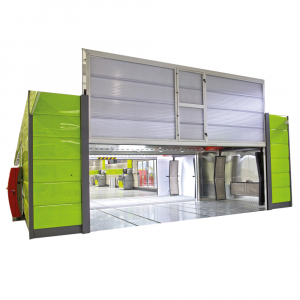 The KombiTron has an independent ventilation system for inlet and outlet air. 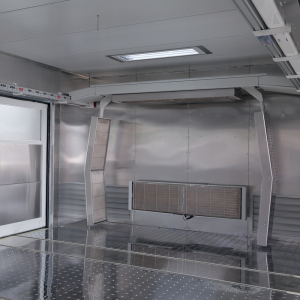 The ventilation system removes the solvent gases that are produced during the paint drying process. 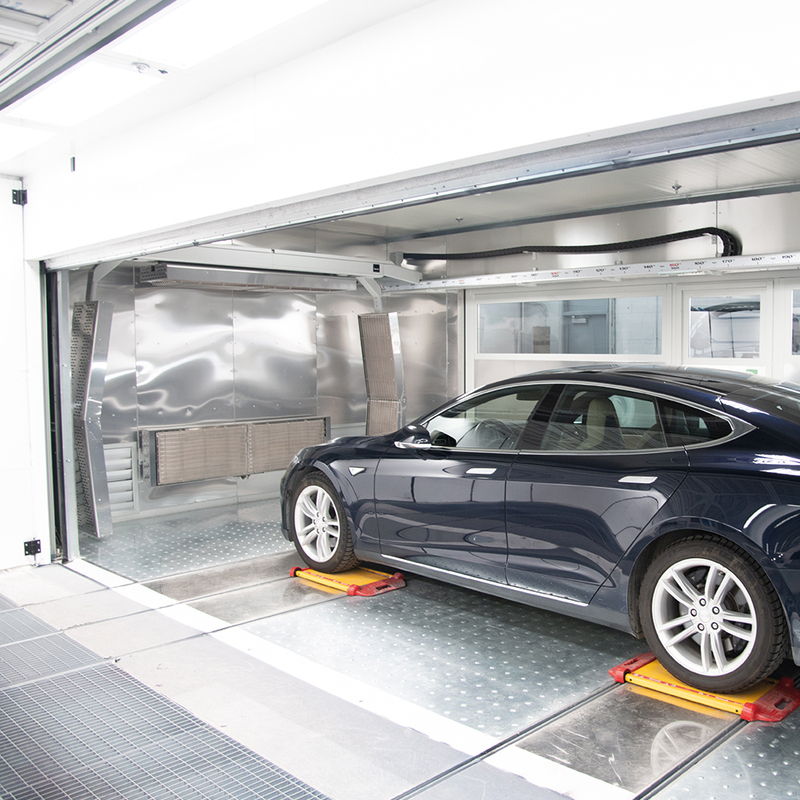 The KombiTron is equipped with side pneumatic doors and CarMover rails, allowing painters to move vehicles in and out in a few seconds. 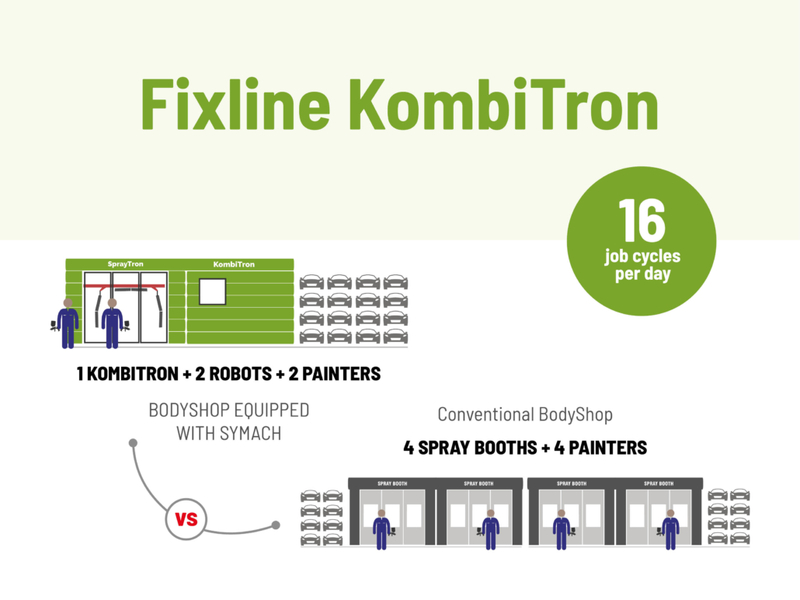 A KombiTron, including robots, is normally installed in FixLine projects to produce 16-20 paint cycles per day. The KombiTron drying performance with the robot is 8-12 minutes depending on which hardeners are used in the clear coat process. 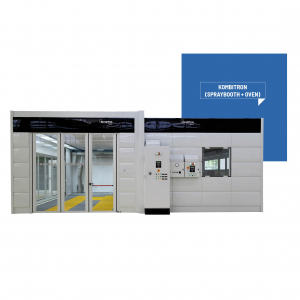 – with two pneumatic doors. 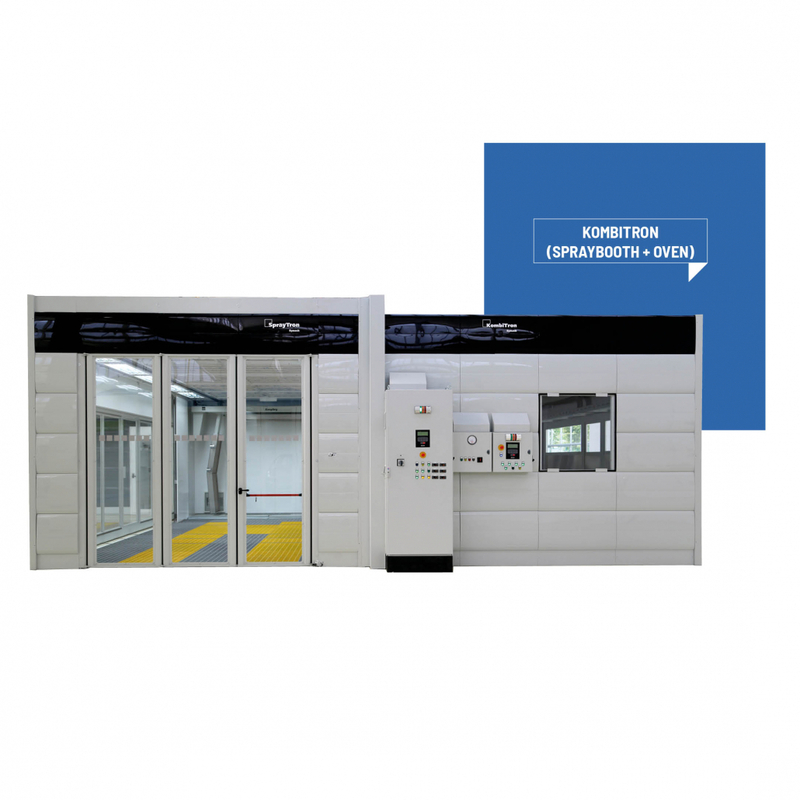 The KombiTron has a pedestrian door and two side doors opening and closing pneumatically and vertically, which helps avoid dust moving. 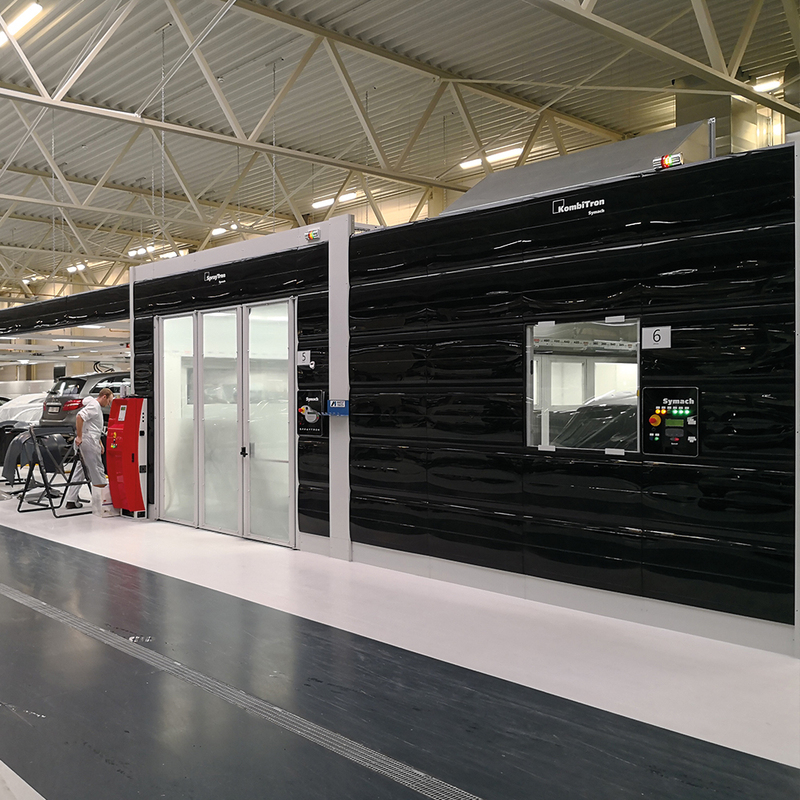 The KombiTron side panel is a tubular-welded frame and inside the booth there is a reflecting aluminum sheet on the side; in the middle there is 5 cm or 2 ” of insulation; and on the external side there is the CoverTop, which is an ABS plastic panel available in eight different colors. The computer of the KombiTron is integrated with the EasyDry robot. 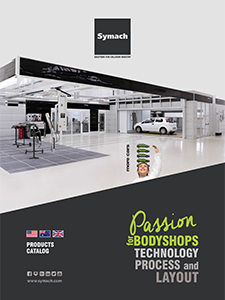 > Please refer to EasyDry catalog for more information. 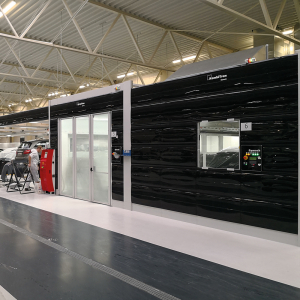 In addition to the standard functionality of the EasyDry, the KombiTron can manage the two additional groups of Drytronic radiant panels: one in the front and one in the back wall of the cabin, to properly dry bumpers installed on the vehicle or pieces on stands. 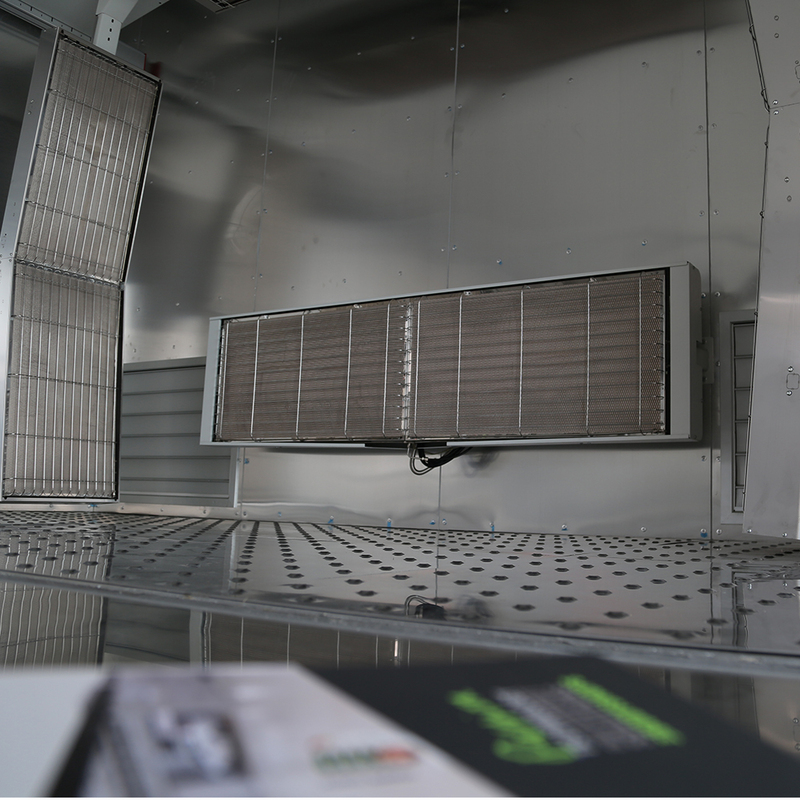 The roof’s a tubular-welded frame to support the air ventilation channel and the filter inlet air. 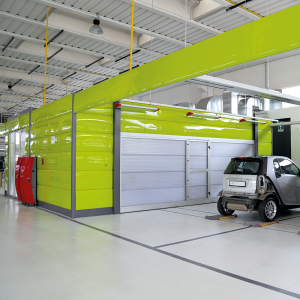 The floor uses a reflecting metal sheet. The ventilation inlet and outlet uses two different fans. 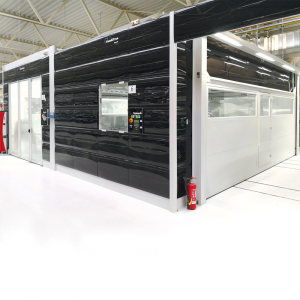 The outer covering of the KombiTron consists of “CoverTop” panels that are made in ABS injection plastic mold. 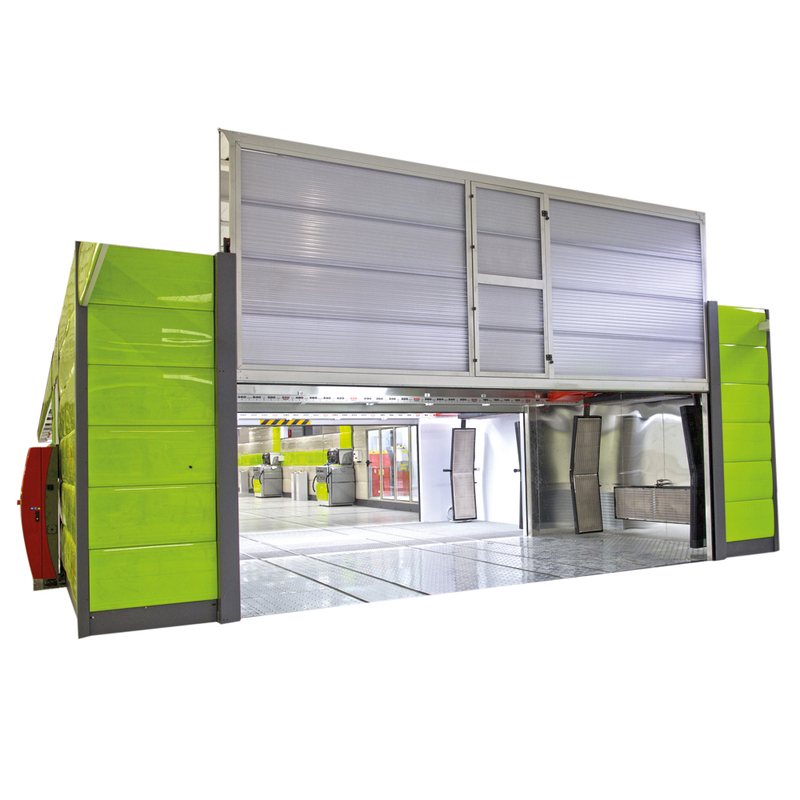 They can be opened and closed, allowing the installation of the electric or air compressed plant inside the SprayTron wall.